Forget cooked or gourmet vegan, if you really want to be healthy -raw vegan is the way to go. The key word here is RAW. Anything that is cooked, fired, or heated above 118°F, and processed, is unhealthy for you, even if it is labeled "vegan". LIVE foods, in their natural untampered state is what it's all about. Cooked food is dead food and quickly spoils and becomes toxic in your system. Live raw food does not spoil or decompose quickly and is packed with energy, minerals, vitamins, and everything you need to stay healthy. Most of the world's population still thrives on a plant-based diet, much of it raw. It is largely here in the "modern" Western world where the animal-based diet dominates. Animal-based diets which include meat, dairy, and eggs, are responsible for most of our modern diseases and illnesses. Meat and milk alone, especially in their processed states, are the primary causes of a slew of diseases such as cancer, heart disease, diabetes, arthritis, osteoporosis, and a host of other maladies. Grains, which are plant-based but artificially farmed or produced, can also be problematic, especially wheat and white-flour based products. Most of these foods cannot be eaten raw and must be cooked, processed, or treated before we can ingest them, and that is where the problem begins. Cooking not only kills the food destroying its nutrients or enzymes, it changes its composition and makes it very difficult for the body to digest or process. Perhaps even worse than the cooking are the chemicals and additives(sugar and salt being major) in our food which are extremely harmful and addictive. Most foods are becoming increasingly tampered with both chemically and genetically. That is why it is best to go to a local farmer's market and buy fresh and/or organic rather than rely on your supermarket. Corporate mass-producers of food are only interested in profit, not health. Even better than relying on farmers is growing the food yourself. If you have a garden or plot of land, count yourself lucky. Turn that useless lawn into a fruit and vegetable garden. For those in the colder climates, greenhouses, solariums and indoor crop growing are becoming increasingly feasible. Compost makes the best fertilizer. Most of us, however, still need to rely on the markets, so be picky and demand fresh quality produce, free of any pesticides or other chemicals. The raw vegan diet is plant-based and basically includes raw fruits and vegetables, nuts and nut pastes or butters, seeds, grain and legume sprouts, plant oils, herbs, and fresh juices -preferably organic. Organic produce, though more expensive, is much sweeter-tasting and healthier than non-organic. Switching to a raw vegan diet from the modern cooked diet can be a huge step and may produce a serious detox crisis so it is advisable to first take intermediate steps like going vegetarian or vegan and getting off of refined sugar and salt and other harmful or addictive chemicals. Bread, baked goods and flour or grain products in general are perhaps the most addictive foods of all. Our modern Western diet is very taste-oriented and we are basically all drug addicts, so this is the hardest part to get over before you can enjoy the benefits of a natural raw diet, but the fight will be worth it. It usually takes about a month or two for the old food cravings to subside or vanish, depending on your particular state, or method of transition. One of the first effects of the raw food diet is the weight you will lose. 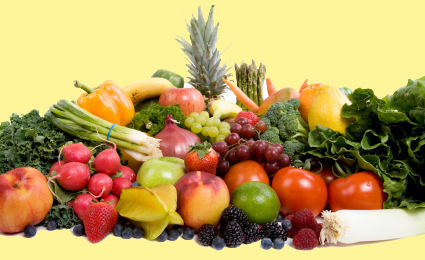 No matter how much raw fruits or veggies you eat you will never gain weight. You will in fact LOSE weight, especially if you are unhealthy or overweight. It is the perfect weight loss diet! The reason we gain a lot of weight on cooked or processed foods is because the body must retain more water to neutralize all the toxins you accumulate on suc a diet. When you eat raw and organic there are no toxins to dilute or neutralize so all that water (toxins included) is flushed out. Also, raw live foods are much easier to digest or assimilate putting less burden on your digestive system and more time into cleaning or repairing your body. For those of you who can't chew or digest properly, a blender or processor is the solution. Smoothies are alright, especialy in the mornings or start of your day, but eating your fruits and veggies whole is always best(as nature intended). All that chopping and grinding chases away much of the life force and there is always the danger of metal or plastic residue going into your food. Many complain about becoming too skinny on the raw vegan diet, but that's usually because there's a lot of damage, addiction, or repair to take care of. Once the cleansing and repair work is done you will naturally regain some weight or whatever your body deems is ideal for you. Most of us are much heavier than we should be. The other effect of the raw food diet is of course the way you look and feel. Once you're past the detox phase, your energy or strength will soar and so will your alertness or concentration. Gone will be your aches and pains or whatever was chronically ailing you. Your eyes will become brighter, your skin softer, and your gait or step faster and better coordinated. Best of all you will slow down or even reverse the aging process, especially if you combine this diet with fasting. Sometimes special cleanses are necessary to get rid of those tough and pesky parasites or deeply inbedded toxins which can impede or slow down your healing process. Healthier, of course, also means happier. You will radiate joy and confidence and will wonder why everyone else is not eating this way. But you must persist. Most people give up too early, often after a few days or weeks into the raw diet. It takes at least a month or two to start appreciating the benefits. Things start to stablize after two or three months. If you are old or in bad shape it is only natural that you will have to wait longer to correct or reverse all those years of indulgence, neglect and abuse. For such, the cleansing and rebuilding process could take anywhere from a several months to several years. Not only will you be doing yourself a favor on the raw vegan diet, but the planet as well. Can you imagine if everyone was a raw vegan? No more disease or pain. No more pollution, industry, or corruption. Everyone would be healthy and happy and the animals and the planet itself would benefit enormously and be greatful. Real food is raw and live and good for you and produced and packaged by nature herself, ready to be eaten and enjoyed. Everything else is man's perversion or experimentation and carries with it a high price. Be smart, be healthy, be a raw vegan!